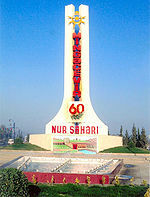 The following table is the list of urban areas by Azerbaijani population. ^ a b c d e f g "Iran-Azerbaijanis". Library of Congress Country Studies. December 1987. Retrieved 13 August 2013. ^ a b c d e f g h i j k l m n "The population of Iranian cities". Statistical Center of Iran. 14 February 2012. Archived from the original on 2012-10-02. Retrieved 13 August 2013. ^ a b c d e f g h "Ethnic groups in Azerbaijan". Statistical Center of Azerbaijan. 2009. Retrieved 13 August 2013. ^ "Baku". Encyclopædia Britannica. Retrieved 2013-08-13. ^ "Orumiye". Encyclopædia Britannica. Retrieved 2013-08-13. ^ "Ardabīl". Encyclopædia Britannica. Retrieved 2013-08-13. ^ a b "Ardabil". Iran Website. Archived from the original on 20 August 2013. Retrieved 14 August 2013. ^ a b c "East Azerbaijan". Iran Website. Archived from the original on 9 August 2013. Retrieved 14 August 2013. 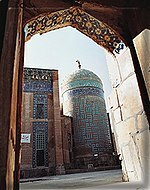 ^ "Familiarity with Miyandoab-Nedaye Urmia". Archived from the original on 2013-09-28. Retrieved 2013-08-14. This page was last edited on 31 October 2018, at 22:22 (UTC).